You don’t want to sacrifice good dental care for temporary convenience. Families in Oshkosh agree — it’s worth the short drive to visit the dental professionals in Ripon at Silver Creek Dentistry! In our state-of-the-art office is where you’ll find the dentist Oshkosh families trust. From excellent general and preventive services to restorative care (including same-day dentistry with CEREC technology), we’ve got you and your loved ones covered with top-notch dental care. You already know how to get to Ripon. Just half an hour’s drive down highway 44 you’ll find the team of passionate dentists serving families and individuals just like you — all in our newly remodeled office. Click here for a tour. Find the comfortable, quality dental care you deserve at Silver Creek Dentistry! The foundation of comprehensive dental care is an emphasis on prevention. We recommend our patients of all ages undergo a twice-annual checkup and cleaning to keep problems at bay — and to catch them early when they do get the chance to take hold. Services in general and preventive care include this six month checkup, during which we’ll take digital x-rays to look for problems that could be lurking beneath the surface. And for patients who deal with major jitters or nerves leading up to and during their dental appointments, we are also happy to provide options in sedation dentistry. Don’t panic when something goes wrong with a tooth or your gums — just be sure you seek the dental care you need quickly. These problems don’t subside on their own, after all. When you need a little help getting your smile back to its original health, you’ll be relieved to know you can count on the team at Silver Creek Dentistry to provide fantastic restorative care. If misaligned teeth are holding your smile back, you should consider achieving a better bite with Invisalign. This clear braces system is designed with busy adults and image-conscious teens in mind. It uses a series of clear plastic trays to gradually shift teeth into their preferred position, without the potential stress or embarrassment related to those metal brackets and wires. The Invisalign system is a wonderful alternative to traditional braces. 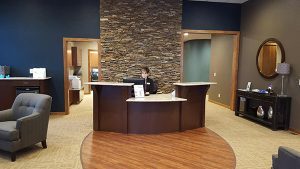 If you’re ready to visit the dentist near Oshkosh offering a variety of services in a clean, comfortable environment, why don’t you get in touch with Silver Creek Dentistry? Contact us to book your visit today!